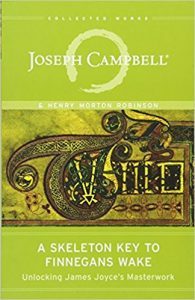 In his 1944 preface to A Skeleton Key to Finnegans Wake, Joseph Campbell calls Joyce’s book “…a kind of terminal moraine in which lie buried all the myths, programs, slogans, hopes, prayers, tools, educational theories, and theological bric-a-brac of the past millennium” (xxiii). 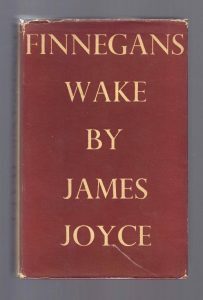 It’s apropos, then, that Joyce’s main character in Finnegan’s Wake is named Humphrey Chimpden Earwicker, HCE, or as Joyce refers to him, Here Comes Everyone. HCE is, himself, a terminal moraine in human form. When Finnegans Wake was published in 1939 (you can see what an early enthusiast Campbell was) many critics didn’t know what to make of it. Vladimir Nabokov, for instance, thought Ulysses to be the finest book of the 20th century, but found Finnegans Wake to be “formless and dull,” “a tragic failure,” and “a frightful bore.” I think that Nabokov may have been wrong in his assessment of Wake, though absolutely right in his admiration for Ulysses. In Finnegans Wake, it might seem that Joyce abandons any regard for his readers. 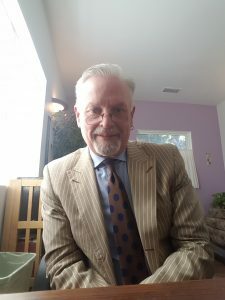 It’s hard to find any narrative traction, and while Wake may be wrought from the English language, it is certainly not written in English, but rather in some strange, “Nichtian glossery which purveys aprioric roots for aposteriorious tongues”; as Joyce writes, “ this is nat language in any sinse of the world” (Finnegans Wake, 83). But Campbell found traction, and boy, did he ever: “Underneath the verbal ambiguities and philologic traps of the Wake, deep speaks to deep about such everyday matters as marital discord, sibling strife, military slaughter, racial violence, theological differences and financial thimblerigging—fascinating material that academicians (at their peril) fail to discuss or continue to ignore” (Skeleton Key, xxvi). What’s more, Campbell sensed the profound influence the work of Friedrich Nietzsche exerted upon Joyce: “Nietzsche’s description of his own creative struggle, ‘I write in blood, I will be read in blood,’ is applicable tenfold to Joyce” (Skeleton Key, 360). But I’ll return to that “Nichtian” influence in a moment. Perhaps it may seem odd, then, that the only thing approaching a ritual that I’ve associated with the arrival of the new year in the past two decades or so is reading from Finnegans Wake. At some point, near the end of December or the beginning of January, I read the last lines of Wake and let it bear me serenely along like the Liffey, “So soft this morning, ours” and a bit later, “End here. Us then. Finn, again!” And finally, Joyce tells me I have the key to the whole thing: “A way a lone a last a loved a long the” and thus endeth Finnegans Wake. 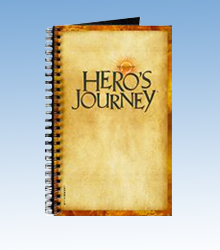 But in this book, as it almost certainly is in life, the end is not really the end. This understanding is the key to life that Joyce offers his readers. That last sentence of the book is the first part of the sentence that begins the novel: “riverrun, past Eve and Adam’s, from swerve of shore to bend of bay, brings us by a commodious vicus of recirculation back to Howth Castle and Environs” (Finnegans Wake, 3). That is the nature of mythic time: circular, recurring, non-linear. There are no beginnings or endings, only the eternally recurring flow. 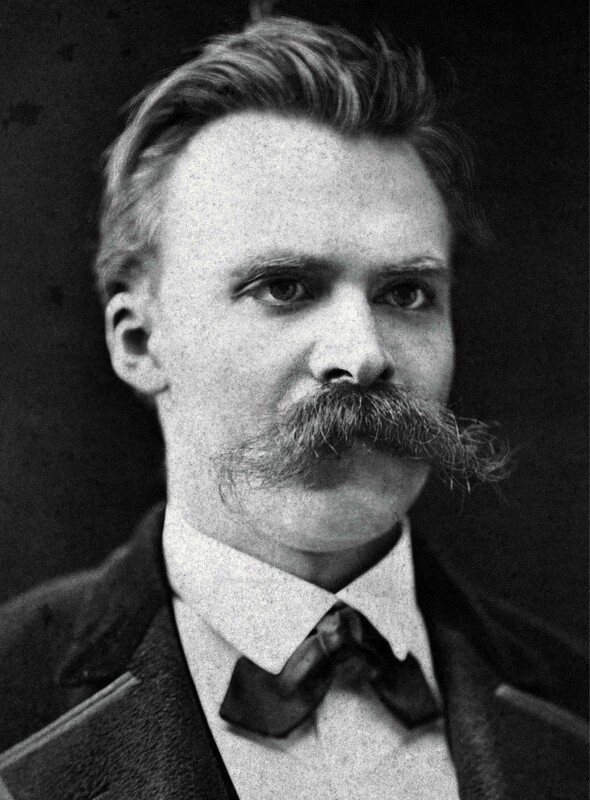 Circling back to Nietzsche’s influence on Joyce, we arrive at the notion of eternal recurrence, an idea central to Nietzsche’s philosophy. Eternal recurrence suggests that since time is infinite, while the things in time (atoms and events) are finite, events—your life, exactly as you have lived it—will recur again and again and again, innumerable times. As Nietzsche remarked, how well disposed to oneself one would have to be to crave nothing more than this and be able to say, “and never have I heard anything more divine” (The Gay Science, section 341)! This is radical self-acceptance; not merely bearing the circumstances of one’s life because it is necessary that one does, but to love it! That’s the move Nietzsche called Amor Fati, the love of one’s own fate, perhaps the most burdensome, the most awesome, of our responsibilities to ourselves. Saying—no, shouting—yes! to life is the primal response to life. The eternal yes is not a call to reformation or redemption, but rather a response to life exactly as it is, embracing the creative, sustaining, destructive nature of life itself. It’s Molly Bloom’s Yes at the end of Ulysses, and likewise, in Finnegans Wake, Anna Livia Plurabelle is, as Campbell notes, “the carrier of the Eternal Yes; […] Men, cities, empires, and whole systems bubble and burst in her river of time” (Skeleton Key, 362). As it is with dreams, the more we live with them, reflect upon them, marvel at the symbols and puzzles of them, the more meaningful to us they become. And so it is with Joyce’s dream of a book, Finnegans Wake. And, as I find with most symbolic puzzles, Campbell stands alongside, enthusiastically pointing the way.